South Australia is a wonderful place to live. We have good Schools, Universities and Technical Colleges. We have imaginative people with skills, passion and enthusiasm. But sadly the traditional businesses and manufacturing industries that once provided skills and the inspiration to get further education in engineering, trades or start a new business are evaporating in front of our eyes. We have a beautiful environment, great food, wine, markets, festivals and arts; a wonderful place to raise a family. But without people believing they can make things, how can we inspire people to do things differently, innovate and start new ventures? These things too will disappear, being sold off as community equity stagnates and people move away. If we truly want an innovative and a creative community that inspires people to create new ventures, pursue further education in engineering, arts or trades in Adelaide we need local people making new and interesting things. To do this we must harness the people in our community with the passion and enthusiasm to do it, not just by recognising them and the things they make, we also need to give them the power to do more, share their skills with others and collaborate with other makers. Although technology and the internet have been a wonderful facilitator of innovation and creativity, we need much more. We need to create a stronger maker culture in South Australia by providing physical spaces and the resources to bring people together. 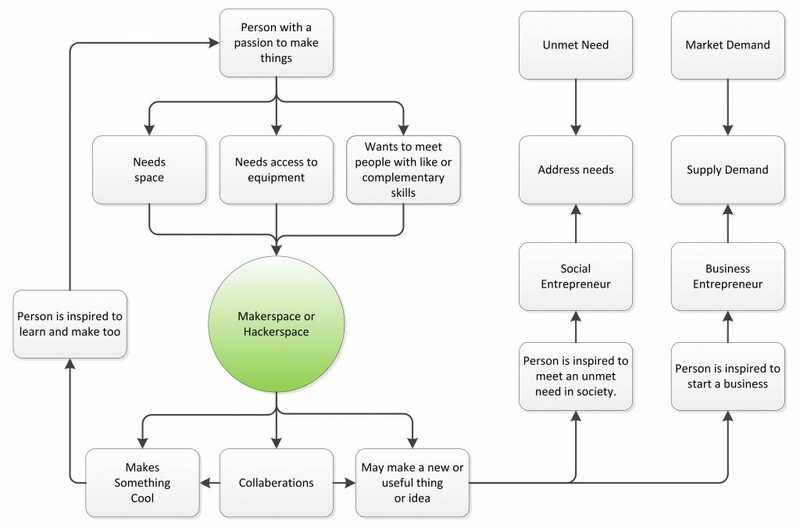 A Makerspace is a space where makers have open access to specialised machinery, technology, materials, the space to work on projects and more importantly opportunities to collaborate and share their skills with others. No new idea, invention, product or business was ever created without a need/demand and someone with a passion. Makerspaces or Hackerspaces and the people who use them sometimes never go there with the intention of creating cool stuff or starting a business. They are just places where people go to make things and hang out with other makers. Sometimes they collaborate and learn new things. Sometimes they might make cool stuff. Sometimes all this making and collaborating will inspire someone to believe they can make things too, and maybe even start a business or enterprise. An active organiser, supporter, and member of numerous science and technology groups. Board Member of SA Makers Inc. and foundering member of Hackerspace Adelaide Inc.